The Gru Next Door - Universal/Illumination's acclaimed anti-hero returns to the big screen in the 3-D summer sequel Despicable Me 2. Hail the Magnificent Mollusc - Turbo, DreamWorks' second animated feature of 2013, offers a high-energy tale about an unlikely hero who dreams of winning the Indianapolis 500 race. The Dream Team Is Back - Marvel's Avengers Assemble brings the very popular and quirky superheroes to the Disney XD lineup this summer. Holy Awesome, CG-Animated Show, Batman! - Glen Murakami and Mitch Watson chat with us about Beware the Batman, their highly anticipated animated series on Cartoon Network. 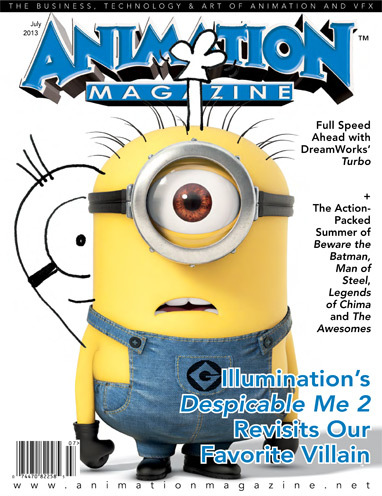 Despicable Me 2, Turbo, Avengers Assemble, Beware the Batman, Man of Steel and much more!